In summary: A perfect companion and conclusion to The Afterman storyline concept. Musically and lyrically heartfelt and one to definitely check out. 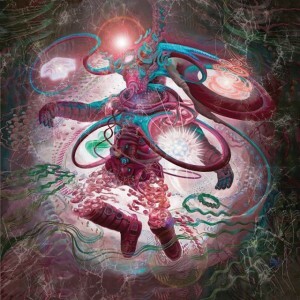 Following on from 2012’s ‘The Afterman: Ascension’ here only a few months later Coheed and Cambria bring us part two of this opus in ‘The Afterman: Descension’ and if it’s anything like the first then this will be an album of epic proportions. I really enjoyed Ascension and following the story so even though I had the story spoiled for me by none other than guitarist Travis recently in an interview we did, I’m still looking forward to hearing it play out. I am a fan of a concept album, and there’s one thing that Coheed and Cambria have always been well known for it’s their ability to tell a story through their music, and the intertwined story sequences here really make the album for me. The songs themselves are heavy this time around, and a song like ‘Key Entity Extraction V: Sentry the Defiant’ has just become my new favourite song of theirs, great melody, great lyrics and just heavy, but to follow that with ‘The Hard Sell’ and it’s almost classic style sound, in particular the guitar tones in the solo I absolutely love. Diversity, a word that just came to mind as the almost 80’s style track ‘Number City’ is playing through my computer speakers, it’s different, odd, yet suited here. Not many bands could get away with this type of diversity, so when it jumps straight back in to ‘Gravity’s Union’ and it’s pounding drums and distorted guitars you don’t even bat an eyelid. Lyrically this one is a standout and at almost seven minutes in length, it is amazing. The Descension continues with the wow, this one sounds so good, this is ‘Away We Go’ and what a feel this has as it sounds like a Cheap Trick meets Elvis Costello type vibe and once again, from an absolute ball tearing riff to this is perfect. This reminds me of a Marvelous 3 song and that makes it an absolute winner for me, sorry all other songs, this is my favourite. ‘Iron Fist’ slows it down with I guess you could call it the ballad on the album which leads in to the single lifted from the album in ‘Dark Side Of Me’ which is very ‘classic’ sounding Coheed and Cambria in my opinion and is the perfect set up for the later side of the album as we get to the crux of the story and I don’t know about you but I’m actually feeling for the character Sirius in the story… music is an amazing thing in that regard isn’t it… but with lyrics like “I gave my everything, for all the wrong things” you can really understand. Then too end this amazing album we have ‘2’s My Favourite 1’ and it’s quite upbeat nature and not what I was expecting, oh wait, it’s turning darker, with a perfect fade out the album is over and leaves me wanting more. I urge you to listen to this album, actually, listen to them both, in sequence and take in the full story the way it’s supposed to be heard. My only question for Coheed and Cambria is, what’s next? Record label: Everything Evil/Hundred Handed Inc.